I had the chance to jump on a phone call with Paul Fry, cordless products Guru for Milwaukee Tool. Okay, so I might have made up that title for him, but he’s our go-to guy when it comes to understanding Milwaukee M18 tools. I had some questions about the current state of the M18 platform and he shed some light on it. Increase Voltage or Decrease Resistance? For years, the cordless side of the industry has increased power by increasing voltage when they hit a wall. That was the most effective way of dealing with the need for more power on NiCad tools and it really conditioned the market to that concept. Looking at the power equation, there’s more than just one variable to adjust. Essentially, this equation shows that an increase in resistance lowers the current and results in lower total power output. On the other hand, reducing resistance increases current and the amount of power you get. All that to say that when Milwaukee targetted their next breakthrough for the M18 line, a lot of their focus went into reducing resistance. Paul explains that simply increasing the voltage or dropping the resistance in the pack doesn’t solve all your power problems. It’s actually a three-piece problem that also includes the electronics and the motor. All three of these have to be in a position to handle the increase in power or you won’t get all of the performance benefits you could. The other upside of going this route is that you’re building a tool with higher quality components and better overall quality. In this stage of cordless tool evolution, there’s a legitimate fear among users of Milwaukee M18 tools that they’re going to have to increase the voltage at some point and leave them with a truck full of obsolete (and expensive) tools to replace. Milwaukee has no plans to leave the M18 line behind. I asked Paul if there are any 15-amp corded tools that M18 can’t replace in terms of power. After all, if you can run pretty much anything that takes a 120V outlet, you’re in great shape to have a cordless job site. The short answer is that Milwaukee M18 tools can or will have the power to run all of those tools. The new M18 Fuel 9″ Angle Grinder is a good example. The nagging question is how duty cycle comes into play. Take someone on a shipyard that’s working with a 9″ grinder all day, every day. 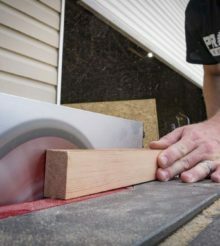 Milwaukee can give you the power from that corded grinder, but putting that kind of load on a cordless system all the time is more than it can currently handle. So while you can get all the 15-amp corded power you need, there are going to be some tool classes that lithium-ion isn’t ready to fully replace, maybe ever. The obvious benefit of Milwaukee’s philosophy on M18 is that you’re on a single battery system across the board (with the exception of M12 tools on the compact side, of course). With increasing performance that comes along with the latest generation of tools, I wanted to know if there are any other benefits that come with the line. Realistically, what we’ve already discussed is the meat of it. Milwaukee M18 tools now have the power to compete with anyone, they’re not going to drive you to a multiple battery system or a whole other battery voltage platform, and you can rest easy in investing in the line without fear of things changing on you with the next New Product Symposium. So long story short, Milwaukee has to spend more money to get the same performance. It’s not sustainable. Eventually that extra cost will be passed to the customer in other to compete or the company will stop doing it (or risk going out of business).